Why are people more relaxed and at ease with each other in some countries than others? Why do we worry so much about what others think of us and often feel social life is a stressful performance? Why is mental illness three times as common in the USA as in Germany? Why is the American dream more of a reality in Denmark than the USA? What makes child well-being so much worse in some countries than others? As The Inner Level demonstrates, the answer to all these is inequality. 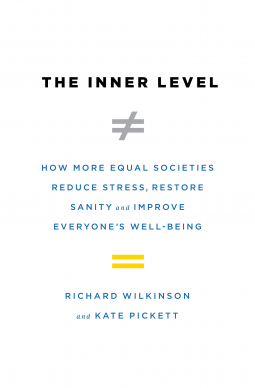 In The Spirit Level Richard Wilkinson and Kate Pickett put inequality at the center of public debate by showing conclusively that less equal societies fare worse than more equal ones across everything from education to life expectancy. The Inner Level now explains how inequality affects us individually, altering how we think, feel and behave. It sets out the overwhelming evidence that material inequities have powerful psychological effects: when the gap between rich and poor increases, so does the tendency to define and value ourselves and others in terms of superiority and inferiority. A deep well of data and analysis is drawn upon to empirically show, for example, that low social status leads to elevated levels of stress hormones, and how rates of anxiety, depression and addictions are intimately related to the inequality which makes that status paramount. Wilkinson and Pickett describe how these responses to hierarchies evolved, and why the impacts of inequality on us are so severe. In doing so, they challenge the conception that humans are inescapably competitive and self-interested. They undermine, too, the idea that inequality is the product of "natural" differences in individual ability. This book draws together many of the most urgent problems facing societies today, but it is not just an index of our ills. It demonstrates that societies based on fundamental equalities, sharing and reciprocity generate much higher levels of well-being, and lays out the path towards them.